Become the Prince That Was Promised and prevent the onslaught of winter with the LARP Longclaw in hand. Whether as a prop weapon for cosplay or to create a solid offense on the LARP battlefield, this foam sword will serve you well. Lightweight and flexible, this LARP weapon is crafted from dense latex foam with a fiberglass fusion core. The sword is modeled after the weapon wielded by Jon Snow in the HBO series, A Game of Thrones. The realistic detail of this piece is quite impressive. The head of a red-eyed direwolf forms the pommel while the grip is painted to mimic leather wrapping. Fans of the George R.R. 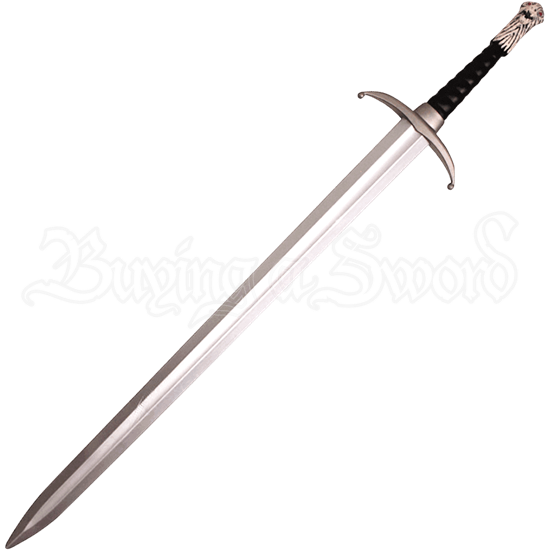 Martin series, A Song of Ice and Fire, are sure to be pleased with the LARP Longclaw.